Before Kyle and I started menu planning, we played the game where we look at each other and ask what's for dinner for an hour, which usually led to a disagreement and then eating something quick and unhealthy. It was a pattern we stayed in for such a long time and we were only able to break it when we did the Whole 30 together in January of 2017. With Whole 30 you pretty much have to menu plan or there is little chance you will have success. There are few restaurants you can eat at and honestly they're not really worth it! After finishing the Whole 30, we decided on a Paleo lifestyle for the majority of the week with one "cheat meal" on the weekends. Even on paleo, there are still are very few restaurants we can eat at and we prefer eating at home over eating out when trying to stick to our paleo lifestyle! 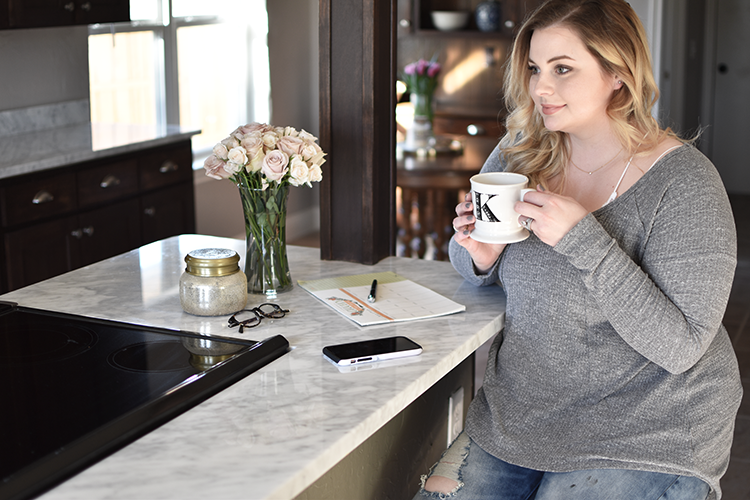 In order to maintain our success, Kyle and I sit down on Sunday mornings with coffee in hand and decide together what we're going to eat for the week. I love doing it together because it gives each of us a chance to have input and I don't end up cooking things only I want to eat! 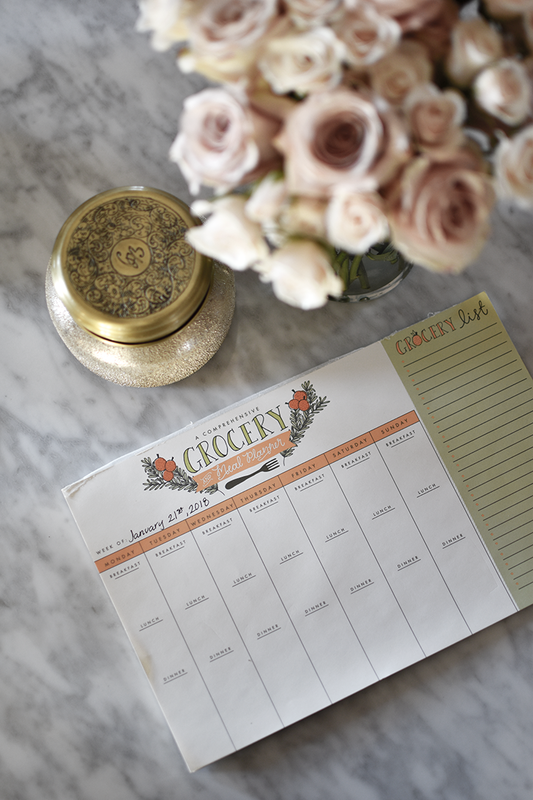 I found the menu planner I use last year at Anthropologie and while they don't sell it anymore, I have found this year's version here! The reason I love it so much is because I can list each meal and make my list at the same time. The list actually tears off and that's what we take to the store with us! Kyle is in charge of "the list" and having him there keeps me on track and keeps most of our trips to the grocery store under 30 minutes. 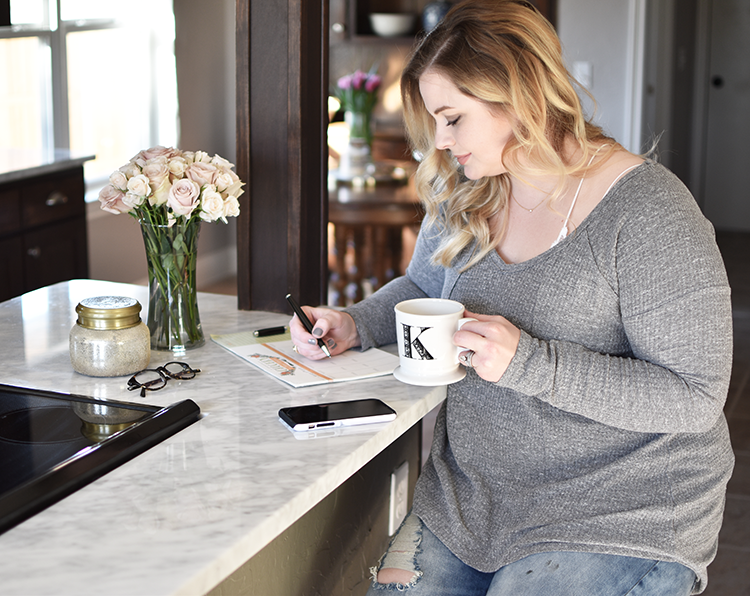 I've seen some people who meal plan for an entire month (#goals) but I prefer to sit down and meal plan for each week! Before I start deciding on meals, I think of meetings and events either one or both of us have and write them down on the day they're occurring. After I'm done with that, I ask Kyle what he's feeling like eating for the week and decide what I would like and write it on a separate sticky note. Then I start assigning a meal to each day and try to diversify our meat/veggie options so we don't end up eating chicken 3 nights in a row. Once I have all the meals planned out, I write down all the ingredients I'll need and take the time to look up the recipes. I also take a screen shot of the recipes so I have them on hand in my photo album of my phone when I go to cook them during the week. This saves me the frustration of having to go to Pinterest and wait for multiple pages to load and trying to scroll through the page while I'm cooking. Even if you aren't eating paleo, Whole 30 or some other diet, meal planning can still be a great way to organize your food for the week. I've found we have much less food waste, we're saving money and have a lot less "what do you want to eat?" arguments! I hope this helps you get on track with whatever dietary lifestyle you adhere to. If you have any great meal planning tips I'd love to hear them!